Chop It Off: Stunning Hair Colours That Look Better On Shorter Hair! Adding some hair colour to short hair is the best way to bring out its texture and style. 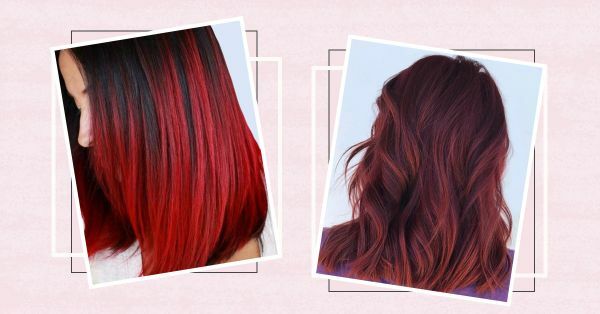 Short hair lacks the length needed to play with too much colour, but these stunning hair colour ideas will re-invent your lob! If short hair and lobs are your go-to, lowlights and highlights are your best bet. What are lowlights and highlights? Lowlights is a technique used to darken your hair by using colours that are darker than your natural colour. For highlights, on the other hand, you typically opt for a shade lighter than your natural hair colour. When combined, both techniques can give your hair a very natural back-from-the-beach look. They create depth and add volume to your hair while adding a flattering dimension to your haircut. This chocolate brown dimensional bob is the perfect example of using highlights and lowlights to add dimension to your hair. This is a great high-fashion and low-maintenance hairstyle if you’re looking for something stylish yet hassle-free. A burgundy ombré is a great option if you have natural brown hair. Don’t rule out or be intimidated by red unless you give it a shot. This colour looks most flattering on brunettes and this warm-brown-red hair is a gorgeous take on the ombre, balayage hair trend. If you want to add some really subtle accents to your hair, these lowlights are perfect. Choose a colour that’s very close to your natural hair shade to give it the most natural look. The hair colour is visible mostly during the day when the light hits your hair and is perfect for someone who is not looking for a drastic change but wants to add a little dimension. Red on black always wins! A bold red ombré fading through black looks the most stunning on shorter hair. This colour will boost your confidence, ego and attitude. Girls, this maybe one of those transformations you can consider getting if you believe that changing your hair will change your life! This colour looks beautiful on both straight and curly hair types. If this bright cherry red isn’t your thing, opt for plum red or even auburn. This caramel ombré hair colour is the perfect blend of brown, blonde and caramel highlights and lowlights. This hair colour practically defines spring-summer hair goals. The colour will add oodles of glam to your hair and also give your hair the appearance of being fuller and thicker. Win-win!